Maybe this world is just a simulation? It is that perspective that kick-started this website. One day, sitting by the dock at St. Andrews, Scotland, it was like I was remembering that I'd started to play this 'Earth game' for the fun of it and none of it was real. Did my heart sink because I realised that nothing had any meaning? No. My eyes opened in wonder at the incredible creation that I was living in. What a simulation! And what freedom to be able to explore it. This fuelled my enjoyment of travelling and playing games while traveling. 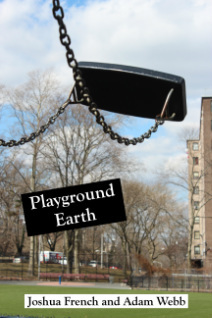 My boyfriend, Adam, and I wrote 'Playground Earth' as a new sort of travel guide... with travel as the focus. Click on the link or the photo to the left to purchase the book and find many more games like the ones below. You don't need to visit the tourist honeypot sights to have seen a place. Some of my most delightful moments over the last few years have been in towns, villages and parts of the countryside that most tourists would never bother with, because I was awake to the details and opportunities of that place and moment. Get a local map and draw a random shape on it. It could be linked to the occasion or place. For example, in New York you might want to draw a big apple; on Valentine's day you could draw a heart. Walk, or cycle, that shape as best you can. Choosing a certain colour and photograph things that are that colour throughout the day. Looking for ways to make up the letters of the place you are in. For example, the 'N' of 'Newcastle' could be written in sand, the 'E' formed out of some leaves that you kicked up and so on. Decide on some random words, ('Beast', 'Adrenalin', 'Prayer' for example) and then look for an image that artfully expresses the meaning of the word. This could be competitive; you and some friends could all do your own version of each word and vote for the best in the end. This is a wonderful way to avoid tried and tested tourist routes. You go where the locals go during their daily life. A good way to select people is find someone walking a dog. Casually walk along behind them and follow their route, taking in the ambience of the place without having to make decisions, just follow. To avoid staying with one person for too long you need to stop as soon as they stop or go into a building, and wait for another dog walker. Also, if a new dog walker crosses your path you must switch onto their route. If dogs are a rarity perhaps choose people in hats, or anything else you think would be suitable. Enjoy the relaxing feeling of being led for once and appreciate moments of pleasure on the journey. NB. I'm not advocating stalking or making anyone feel uneasy but I have had so much fun with this that I didn't want to leave it out. Obviously, though, be sensitive if you are going to do this, and follow from a distance! See a tube or metro map as the basis for a giant interactive board game. Buy an all-day travelcard, take a dice and see where the universe takes you. You could make up your own rules about how you could actually win this game, but we kept it simple. We would take it in turns to throw the dice and go that many stops on the line. Once arrived, we would get off and find something to do for fifteen minutes and then get back on the tube. If more than one line intersected at that stop we would then transfer onto the next line clockwise. Why not try to see your own home town or area in a new light? Only walk or cycle on roads you have never been on, only go into places you have never been. Perhaps get an all day bus ticket and see where all the buses you never get go? Go for a drive, walk or cycle ride. Before you set off, look at a map and choose three of four places each (preferable that you have never been to before). Travel through each one and rate them for different categories (‘Atmosphere’, ‘Landmarks’ etc.). At the end of the day, add up the scores and see who chose the best places. I spent a hilariously happy birthday doing this, ending up in places with as diverse names as Braintree, Nasty and Cockfosters. Depending on your particular interests you could turn a day into a search for the best... park, charity shop, pub, statue. Decide on particular criteria before you leave (park could be 'flora and fauna', 'landscape', 'activities', 'facilities' for example.). Give everyone a score-sheet and off you go.